Thirteen people, including the two owners, have been charged over a factory fire in Bangladesh in November 2012 that killed more than 100 people. Police said they had charged Delwar Hossain and his wife, as well as security guards and managers, over the blaze at the Tazreen factory in Dhaka. It was the country’s deadliest garment factory fire. 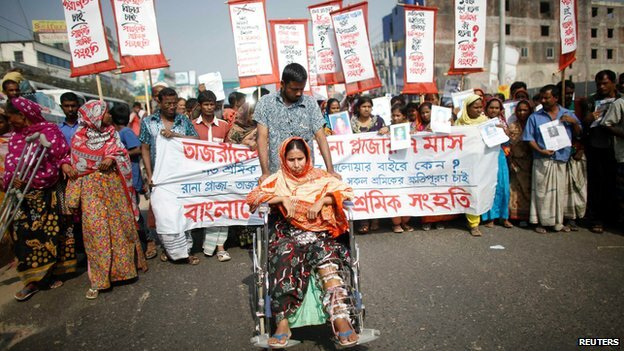 In April 2013 the Rana Plaza factory collapsed killing 1,135. Bangladesh has since pledged to improve conditions at its garment factories. “Delwar and his wife Mahmuda Akter… and 11 others have been charged with death due to negligence,” police investigator AKM Mohsinuzzaman Khan told the AFP news agency. The multi-floor Tazreen Fashion factory, in the Ashulia district on the outskirts of the capital, supplied clothes to a variety of Western retailers including US giant Walmart. The fire sparked protests from thousands of workers who claimed the building had been unsafe to work in; Delwar Hossain denied the allegations. The incident was subsequently overshadowed by the collapse of the Rana Plaza garment factory, also in Dhaka’s suburbs, in April 2013, one of the world’s worst industrial accidents. The disasters shone a light on the poor safety standards of Bangladesh’s clothing industry and the shocking working conditions of many of its workers. International retailers who use the factories such as H&M and Zara, have since signed up to legally binding measures to improve workers’ safety conditions. The Bangladeshi government announced steps to improve conditions for its three million garment workers – most of whom are women. These conditions included raising the minimum wage and making it easier for them to form unions.